Here’s a little more lightness, some online quiz results. Well, some are really light, others a little more informative. 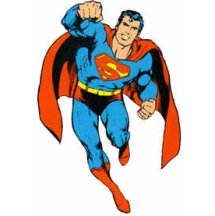 Your results: You are Superman. You are mild-mannered, good, strong and you love to help others. From Personality Project comes this evaluation of the standard Big 5 personality traits. My scores are relative percentages; for instance, I scored higher on extraversion than 21 percent of the population. The extraversion score is roughly correct (and an increase from 10 years ago). Agreeableness is related to accomodation and anger, and I’m generally pleasant and congenial. I’d score myself a little lower, around 90. Conscientiousness makes lots of sense; I have vast quantities of honor and respect for duty. I agree with my emotional stability score in the middle; while I can generate vast amounts of emotional safety and security, at times I basically break down. The only big surprise is Openness to Change. The test measured inventiveness, imagination, and similar characteristics. I can be very creative in problem solving, and scored high. I wouldn’t call myself spontaneous, though – I would have marked myself in the middle here. From OKCupid comes this very interesting offering, The Would You Have Been A Nazi? Test. The religious element is too heavily weighted for brainwashing and underweighted for patriotism here. Catholicism, at least my progressive variety, has a stronger anti-government element. On the other hand, young Josef Ratzinger scored about this level too. Achtung! You are 46% brainwashworthy, 18% antitolerant, and 38% blindly patriotic. Had you lived in Germany in the 1930s, you’d have probably just gone along with the flow. Men with guns are surrounding the house next door? The bagel place on the corner’s gone? Hmm…whatever. The data show you’re a decent person who’s willing to listen to what people of authority tell you. That’s what most people are, and in most times and most places, that’s ok. But not then; not there. The sad conclusion: you would’ve missed your Jewish friends, but you would’ve done nothing about it. Seriously. But rest assured, you would’ve forgiven yourself eventually. If you’re looking for my Myers-Briggs type, The LONG Scientific Personality Test can be taken here. I score as a Counselor, INFJ. I scored 18% I to E, 31% N to S, 38% F to T, and 26% J to P. Inroversion is strongest, which I fully agree with. Though I can be social, it’s draining. Also I score strongly on J over P, which agrees with my natural tendency to order. The iNtrospective N might surprise people, because I work so much with figures in data. I qualify because I form categories and scores, concepts of my own making, not scales of others. Similarly, the F makes sense because I accept emotion, use emotion, and want to feel. This is weakest, and I might truly be a pragmatic rational; the description of NT is close, but SF and ST are farther. On the other hand, Emily Dickinson and Mohandas Gandhi are considered Counselors. One is my favorite poet and the other is on a poster in my apartment. I also think this description is appropriate. Your type is best summed up by the word “counselor”, which belongs to the larger group of idealists. Only 2% of the population share your type. You are so empathic that you often know what others need before they know themselves. You are a complex person who can deal with complicated issues and people, almost prefer to, as you love problem solving. You can be something of an idealist or perfectionist, and should try to take yourself a little less seriously. You are a supportive and insightful romantic partner, encouraging your mate to have dreams and work hard to make those dreams come true. Because you are so creative, you have a wealth of ideas to help them toward those goals. You need harmony so much that you are driven to resolve conflict quickly, as long as the terms don’t violate your ethics. You feel the most appreciated when your partner admires your creativity, trusts your inspirations, and respects your values. It is also vitally important that your partner be open and emotionally available – in other words, that they be willing to share themselves completely.